Ida Kelarova invites the best of Czech and Slovak musicians to collaborate on this music formation that links Romani harmonies and Latin-American rhythms to the sound of a jazz band. Besides classical compositions from previous albums and folk Romani songs, the repertoire also covers new songs composed by the lead singer, guitarist and bandleader, Desiderius Dužda. All the while, Ida Kelarova opens her heart to the audience, investing her legendary voice into this passionate performance. The locally-based Organic Choir will open for the show and collaborating with Ida Kelarova’s Jazz Famelija later in the set. Kelarova will also present a short workshop based around her ‘Everyone Can Sing’ concept. 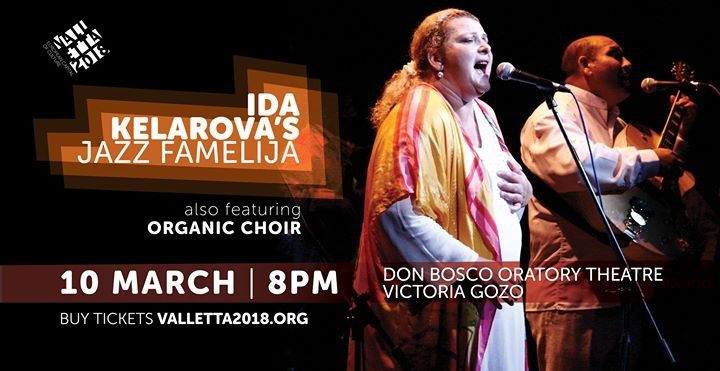 This performance will be taking place on Saturday 10th March 2018 at the Don Bosco Oratory Theatre in Victoria, Gozo.